Taken with Olympus E500 digital camera on January 30th 2007. Click image for larger view. This was shot back in January when I had just got my DSLR camera and had no idea about what I was doing. I quite like the “postcard” feeling to it. 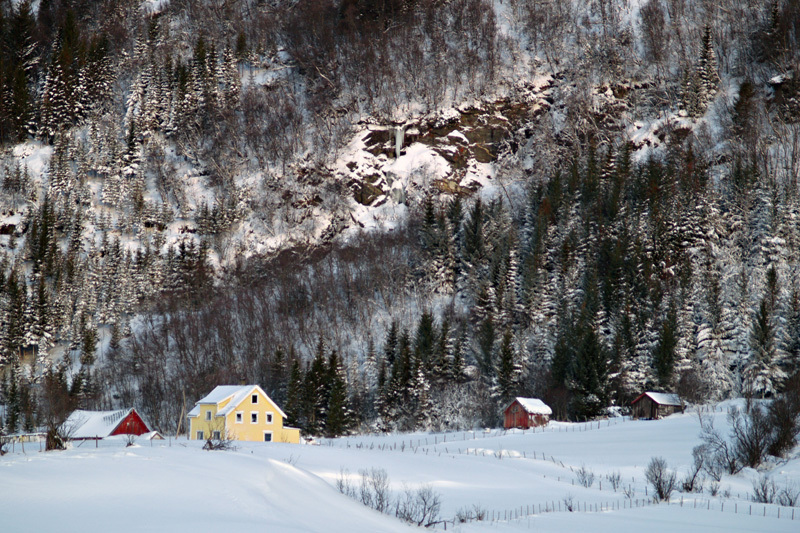 This house is placed directly below a mountain called Ã…-tinden. You can see the mountain here. You can not be afraid of avalanches and live there! Hi Thomas, you would be certainly looking over your shoulder evertime their was a rumble and i suppose you must remember not to shout to loud. I have added your link and feed to my site, are you happy to exchange? Hey, you got some great photographs here, one of these days I might hire you. Steve: Wow, that is one great compliment! Thanks a lot. I am just in love with your site. The pictures are so beautiful. You’re right- that could be a postcard and a lovely one at that. That mountain looks like it’s breathing. Beautiful shot. Nice pictures from your Norway. Your pictures are amazing! I am just in awe of them. I have always had a passion for photography. I try to take as many pictures as I can on different ranches but am in need of a camera upgrade. I always say “one of these days” but that day hasn’t come yet. That looks like an awesome place to live and an awesome shot also! Grand sense of scale in this one! Ja, jeg skjÃ¸nner godt at du har en populÃ¦r side, veldig gode bilder. Jeg hadde aldri vÃ¥get Ã¥ bo i det huset gitt. You pictures continue to amaze me! This is so beautiful!! Great pics – dramatically good! It kind of reminds me of my home time as you can see in the first picshere. Achei muito linda, Ã© muito diferente daqui onde moro, fiquei encantada.